After a miserably failed marriage, Debra Gwartney moves with her four young daughters to Eugene, Oregon, for a new job and what she hopes will be a new life for herself and her family. The two oldest, Amanda, 14, and Stephanie, 13, blame their mother for what happened, and one day the two run off together—to the streets of their own city, then San Francisco, then nowhere to be found. 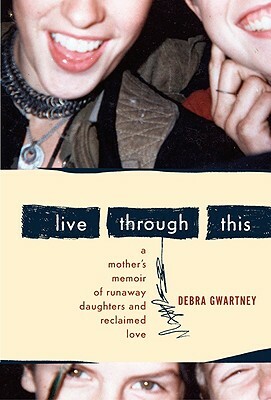 The harrowing subculture of the American runaway, with its random violence, its horrendously dangerous street drugs, and its patchwork of hidden shelters is captured by Gwartney with brilliant intensity in Live Through This as she sets out to find her girls. Though she thought she could hold her family together by love alone, Gwartney recognizes over the course of her search where she failed. It's a testament to her strength—and to the resilience of her daughters—that after several years they are a family again, forged by both forgiveness and love. Debra Gwartney is a former Oregonian newspaper reporter and worked as a correspondent for Newsweek magazine for ten years. She teaches writing at Portland State University. Gwartney is the mother of four daughters and is married to writer Barry Lopez.